I'm a bad blogger lately, I know. I have been busy with work and travel and not a lot of cooking. I will have you know, however, that I am currently in Dayton, Ohio and just warmed up some Handi Snacks pudding cups in the microwave. Woah. I can tell you they are just as delicious as you remembered from your packed school lunches, and eating them slightly warm is almost like eating brownie pudding. Almost. Anyway, these cookies are exactly what I've been looking for. Soft, chewy, sugary. And have you done much experimenting with almond extract? 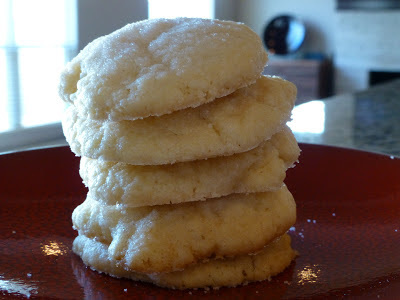 I love it, it gives a perfect hint of something amazing to the standard sugar cookie. Preheat the oven to 350. Cream the butter and sugar, then add in the egg and extracts. In a separate bowl mix the flours, cornstarch, baking powder and salt. Mix it into the butter mixture just until combined. Chill the dough for 30 minutes (this is important). Form the dough into 1-inch sized balls, press to flatten, and place on an ungreased cookie sheet. Sprinkle with sugar, then bake for 8-9 minutes. DON'T OVERBAKE. Sorry for yelling, but the key is to keep these soft. I wish I was eating one right now with my hot pudding snacks.